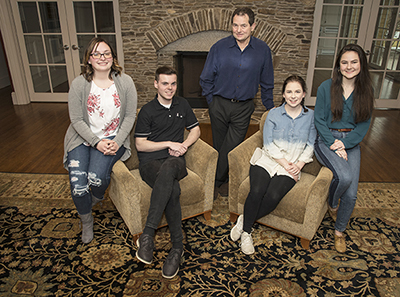 The 13-minute film was produced in spring 2018 by 14 students in a film production class in the Harrington School of Communication and Media. The film features the first-person accounts of Holocaust survivors set against a narrative and intermingled with commentary from Rhode Island lawmakers, as well as Holocaust scholars from URI. The URI premiere on April 1 – free and open to the public — will be in the Hillel Center, 6 Fraternity Circle, at 5 p.m. It will be followed by a panel discussion with two Holocaust survivors who appear in the film, retired URI Professor Albert Silverstein and long-time state resident Jorge Gardos. The panel will also include Robert Weisbord, a retired URI history professor and Holocaust scholar, and Paul Bueno DeMesquita, director of the URI Center for Nonviolence and Peace Studies. As part of the event, DeMesquita will be awarded the Avi Schaefer Seek Peace and Pursue It Award, bestowed by the Avi Schaefer Fund. DeMesquita, one of 10 awardees across North America, is being honored for his work as an outstanding campus change-maker who stands up for peace, justice and compassion on the college campus. On May 1, Temple Emanu-El, 99 Taft Ave., Providence, will show the film as part of the annual Holocaust Remembrance Day commemoration, starting at 7 p.m. Gardos, a renowned violinist, will play during the event, and URI student filmmakers Kat Fortey and Griffin Alix will introduce the film. The event is free and open to the public.